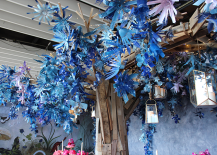 Inspired by the ceramic creations of South African artist Ruan Hoffmann and the murals of Rebecca Rebouché, designer Alexis Givens fabricated this blue and purple dream world for Anthropologie. 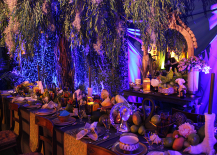 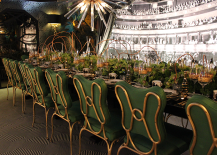 The New York Times let les bon temps rouler with their lush and lavish New Orleans-inspired table designed by Robert Passal Interior & Architectural Design in association with Bergdorf Goodman & L’objet – Vieux Carre. 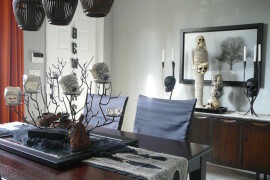 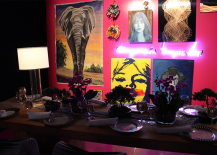 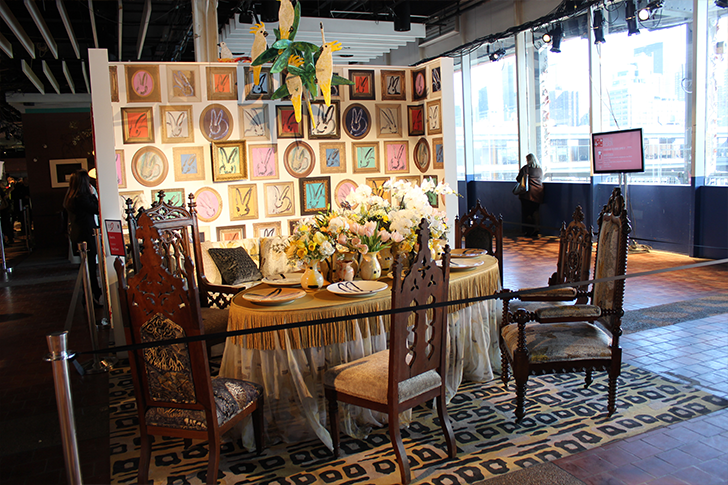 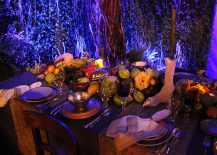 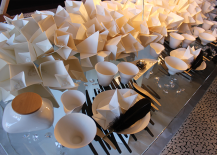 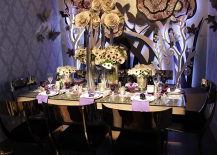 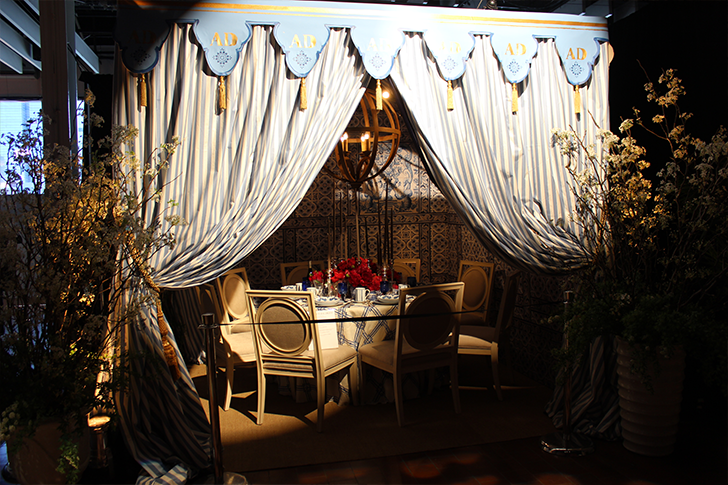 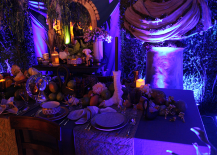 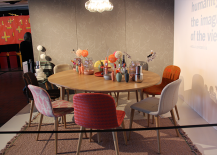 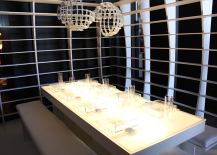 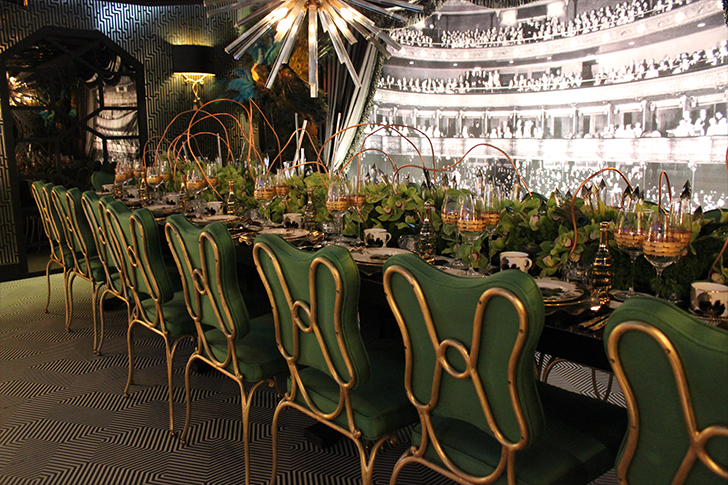 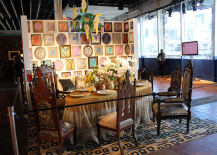 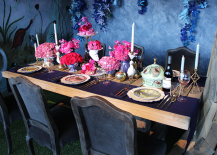 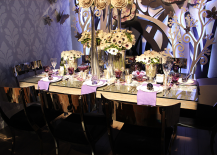 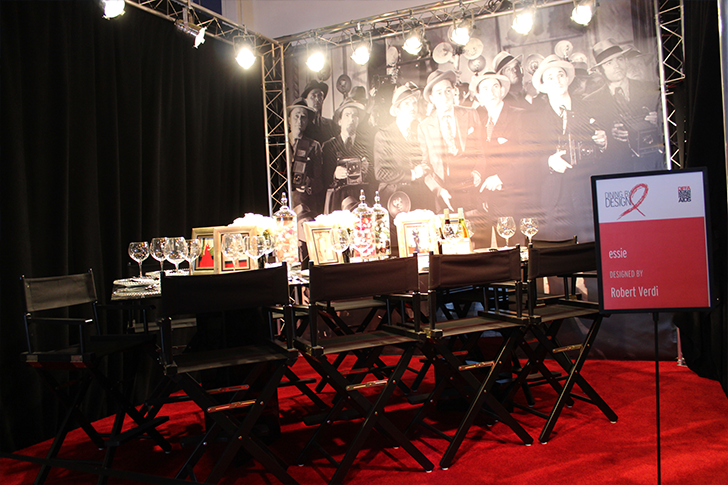 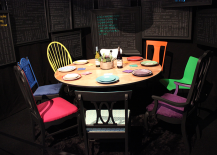 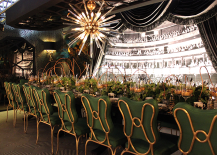 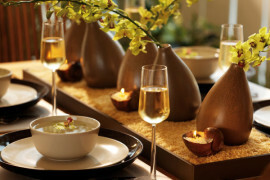 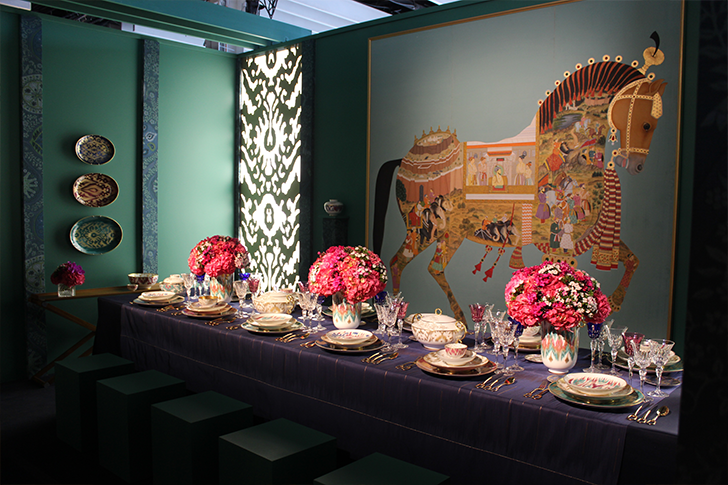 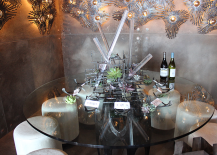 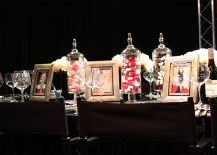 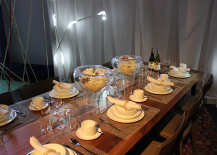 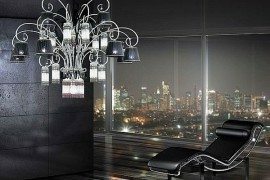 New York Design Center‘s table designed by Marks & Frantz took center stage with its old Hollywood-themed decor. 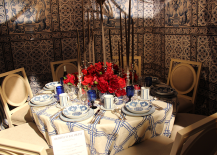 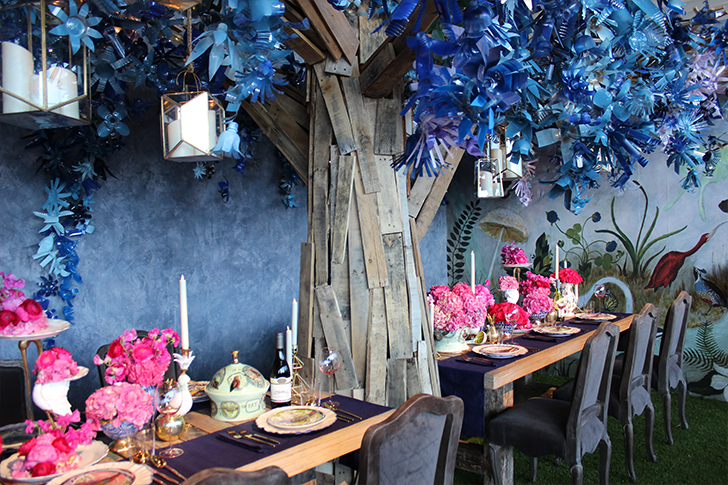 Over at Architectural Digest‘s tented table, we felt like we’d just stepped into a blue and white garden party at France’s Chateau de Groussay thanks to AD special projects editor Bronson van Wyck. 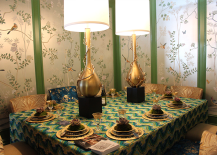 Beacon Hill and designer Corey Damen Jenkins gave diners a taste of Rio de Janeiro with their exquisite 3-dimensional tapestry entitled Branching Out. 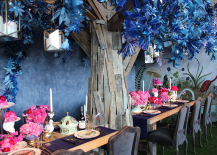 It may have been snowing outside but Stacy Garcia‘s booth was already flourishing with an elegant garden scene built around the bold blooms of her new Paper Muse wallpaper collection. 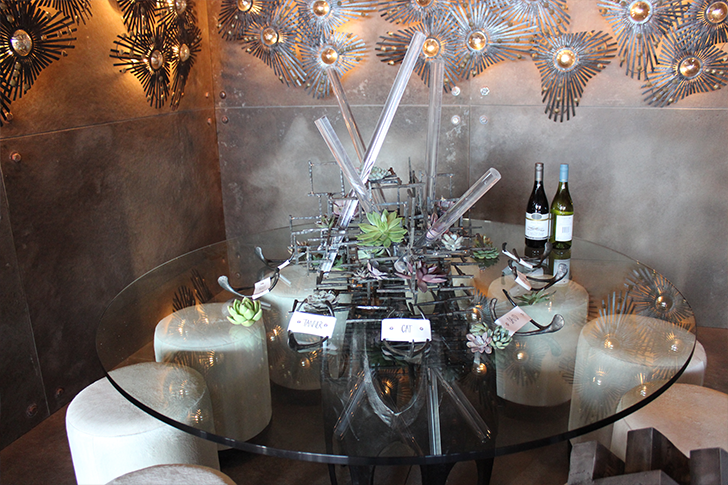 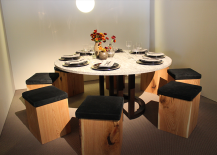 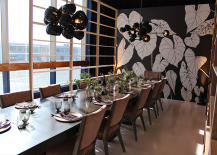 Concrete isn’t the first material we think of when it comes to dining, but Arteriors made it work with their abstract tablescape inspired by the Brutalist movement. 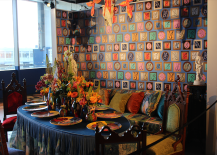 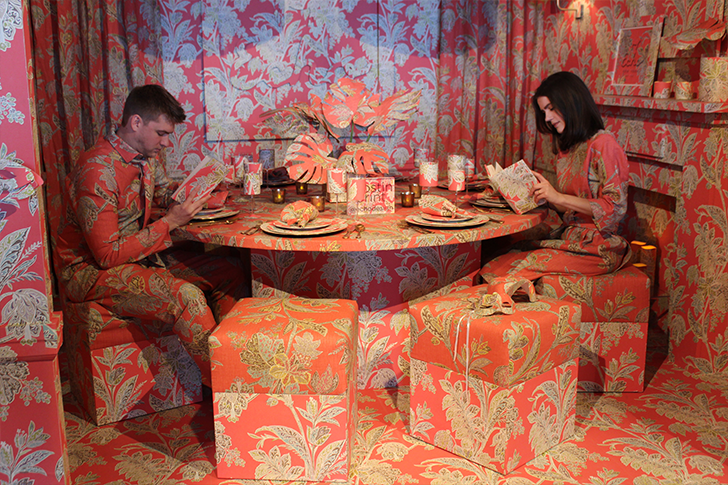 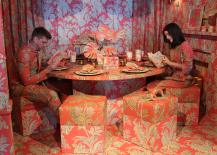 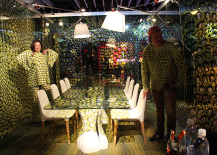 Echo’s voyeuristic display invited guests to spy on a couple living in a world splashed with the pink pattern of their Heirloom India collection of wallpapers and fabrics. 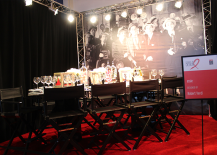 essie stepped away from their usual canvas – our nails – to present this red carpet moment designed by Robert Verdi. 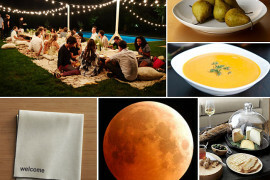 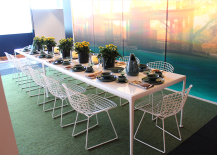 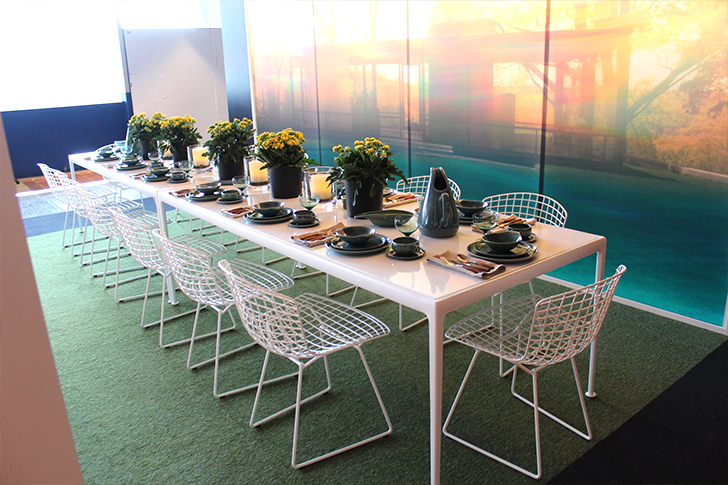 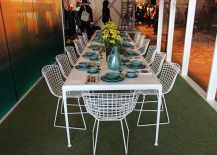 Gensler + 3form‘s Outside|Inside table pulled us into the modern backyard patio party we’ve always wanted to be invited to. 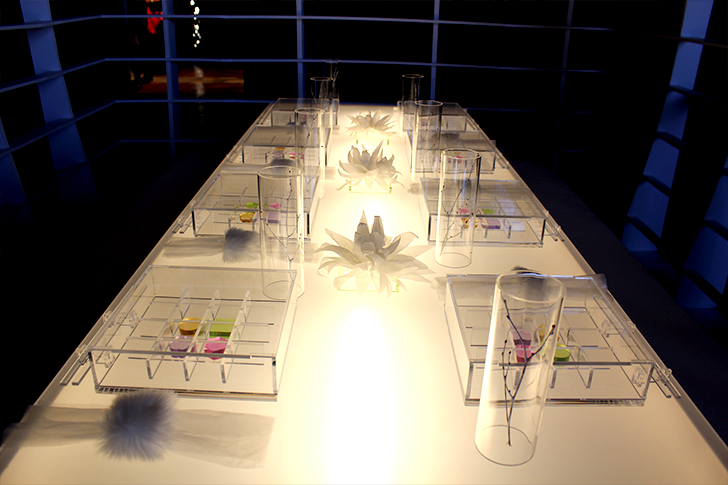 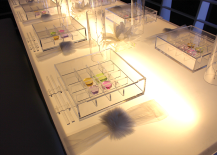 This futuristic sushi shop scene by New York School of Interior Design students Emma Sawry, Alexandra Sobolewski, Sun Woong Youm and Zhaoxu Vince Tong under the guidance of faculty advisor Rene B. Estacio and mentor Brad Ford was a “clear” standout with its ultra-minimalist, light-as-air accoutrements. 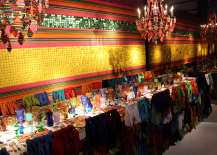 Hermès took us on a journey along the fabled Silk Road connecting the East and the West to debut their new porcelain line “VOYAGE EN IKAT”. 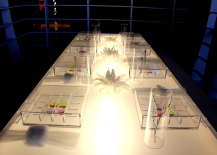 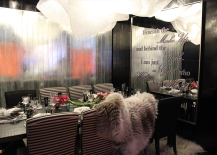 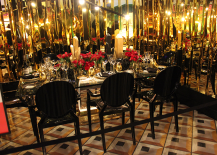 Manhattan Magazine teamed up with Fendi Casa to transport guests in the glamorous world of Marilyn Monroe with their table entitled Ode to Reflections – Invitation to the Light. 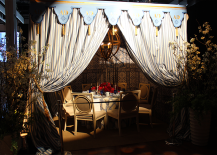 Dransfield & Ross drew inspiration from the 1967 film “Casino Royale” to create a plush and sultry atmosphere for Sunbrella using fabrics from their collection. 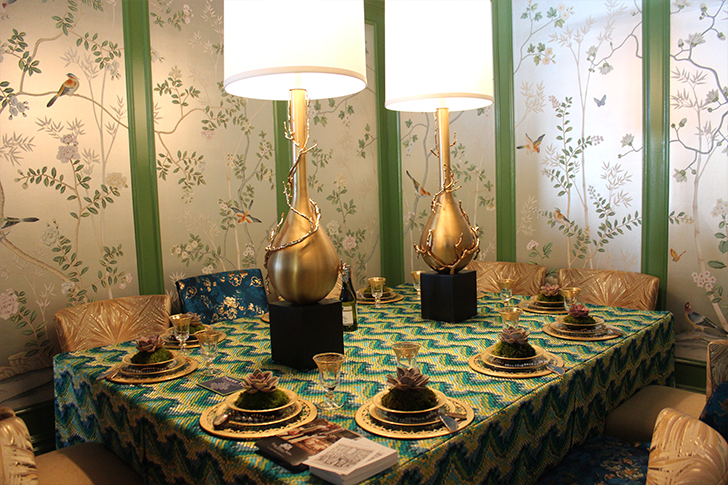 Kravet Inc. enlisted Groundworks for Lee Jofa to turn artist Hunt Slonem‘s Neo- Expressionist paintings of exotic animals and tropical plant life into unique fabrics, wallpapers, and carpets to adorn their space. 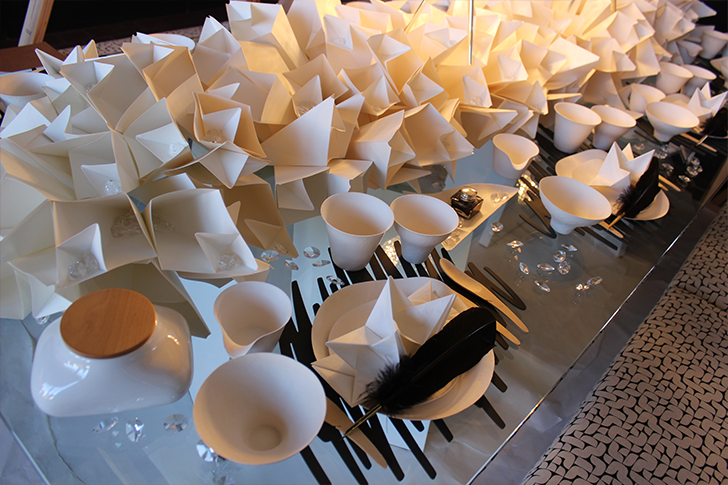 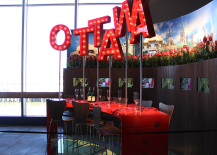 Perkins+Will invited guests to leave their mark on their space by sketching and writing on the many pieces of paper folded that made up its tabletop decor. 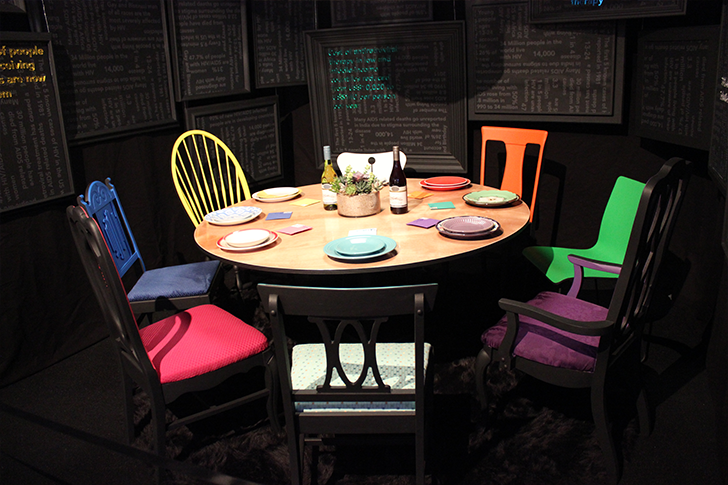 Pratt Institute sent a powerful message about AIDS and HIV awareness with an eclectic, mismatched table designed by students NI-Tsia Cheong, Mariko Higashiyama, Natalie Minott and Mariana Rocha under mentor Elizabeth Bolognino. 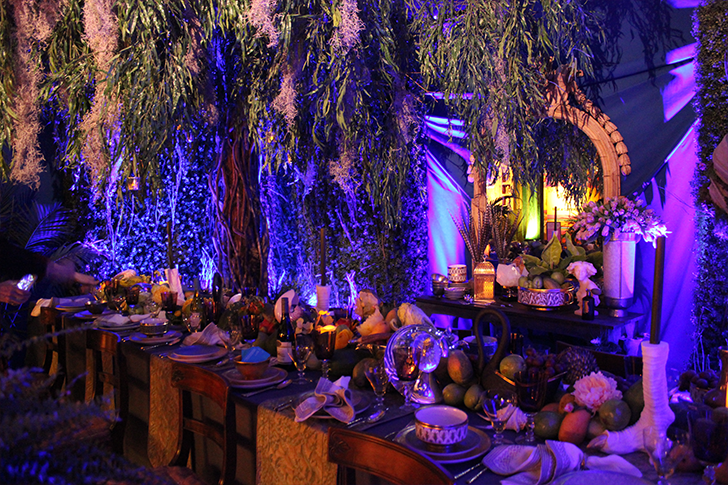 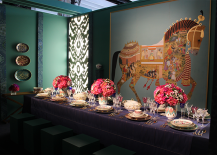 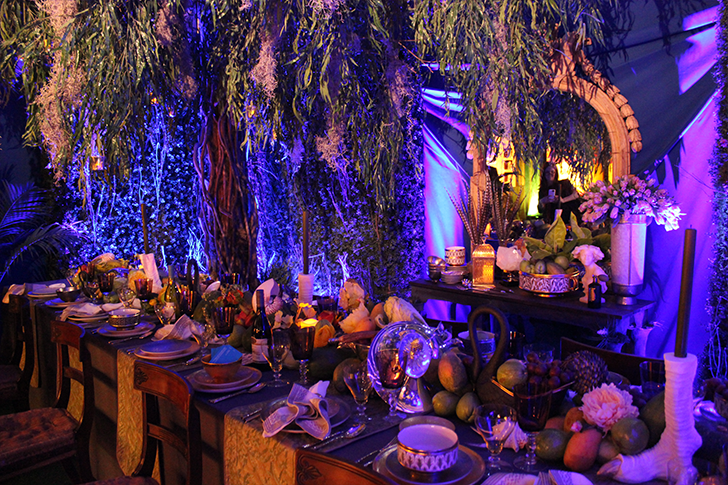 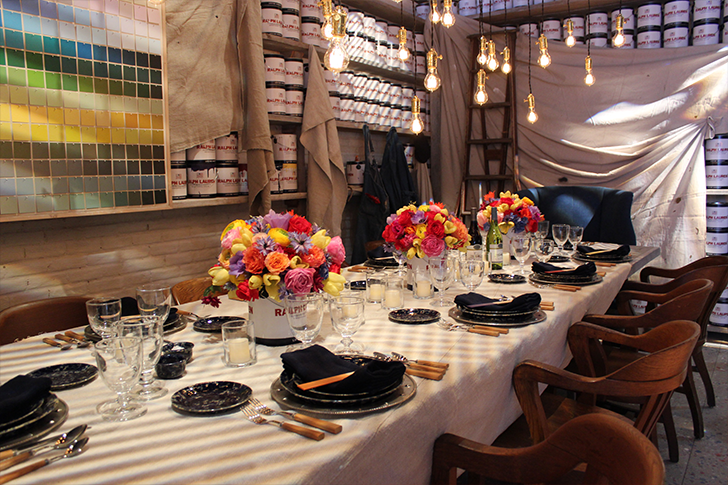 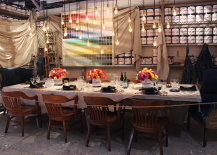 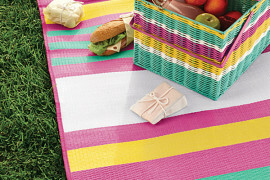 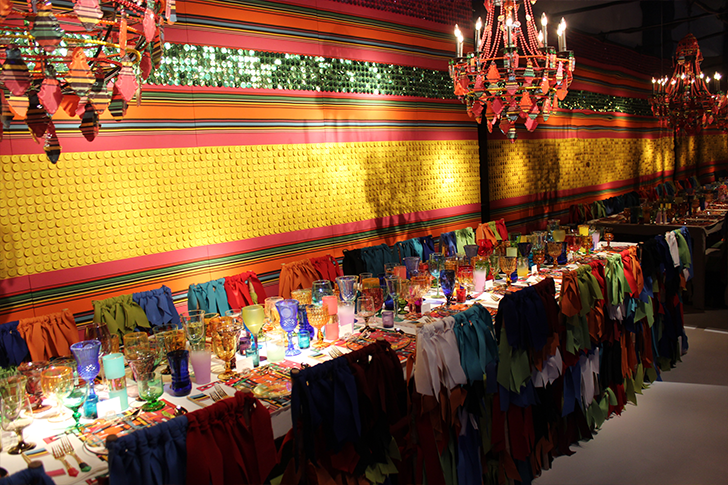 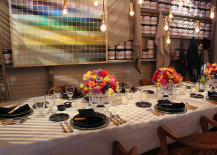 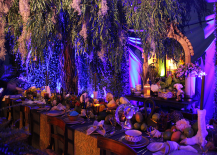 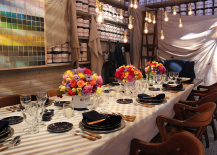 Ralph Lauren Home painted their tablescape (literally) in a rainbow of hues from their signature paint collection. 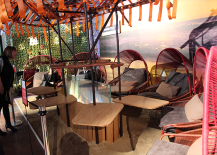 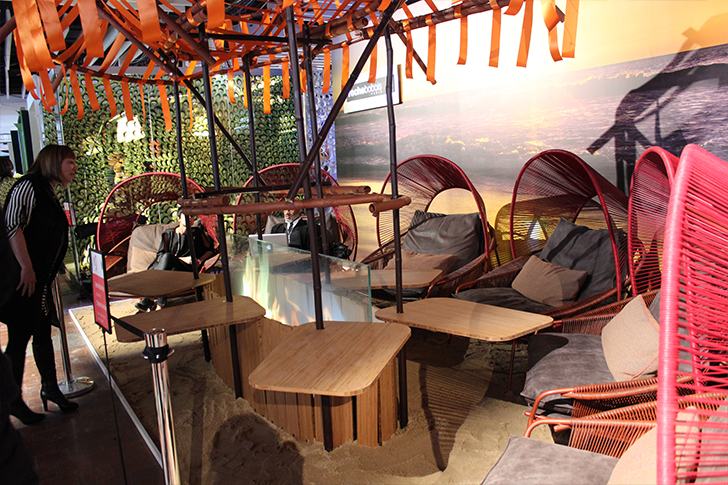 Roche Bobois Paris enlisted designer Stephen Burks to whisk diners away to a cabana-like setting on the beach built around their comfy Traveler chair. 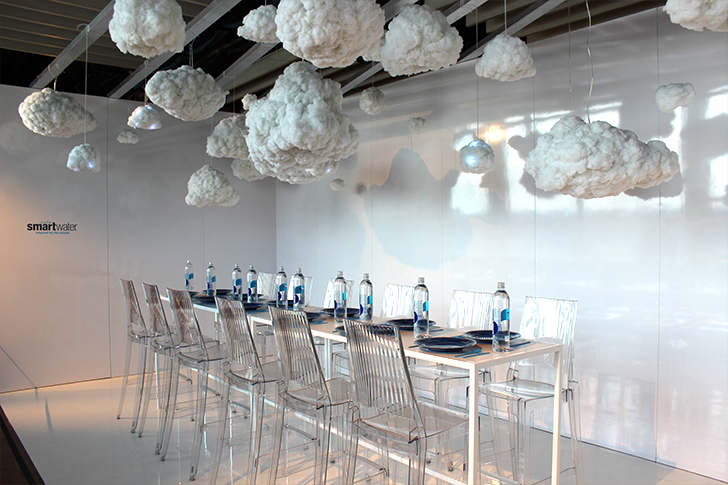 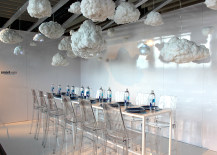 smartwater® made it rain (or at least simulated the hydrologic cycle) at their pristine white booth with fluffy clouds and the soothing sounds of a summer storm. 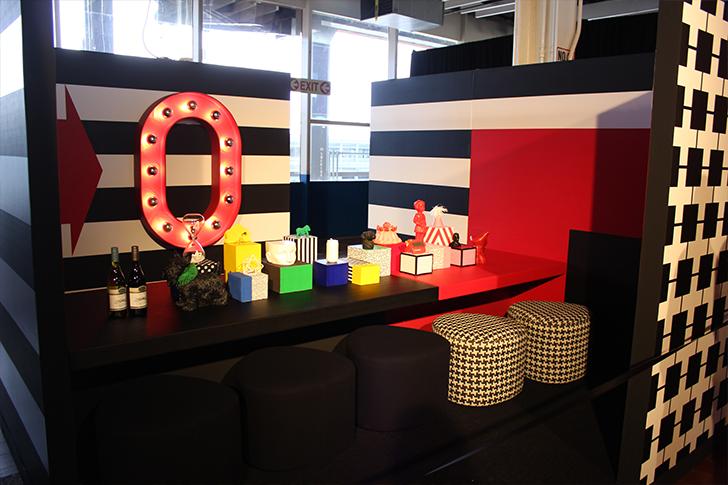 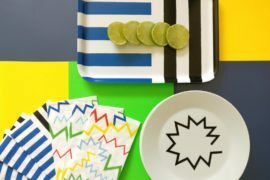 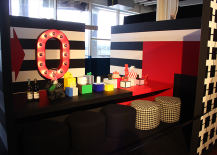 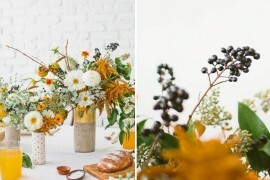 Designer Ghislaine Viñas used HBF Textiles’ Remember Houndstooth fabric to create a memorable environment that’s black and white and colorful all over. 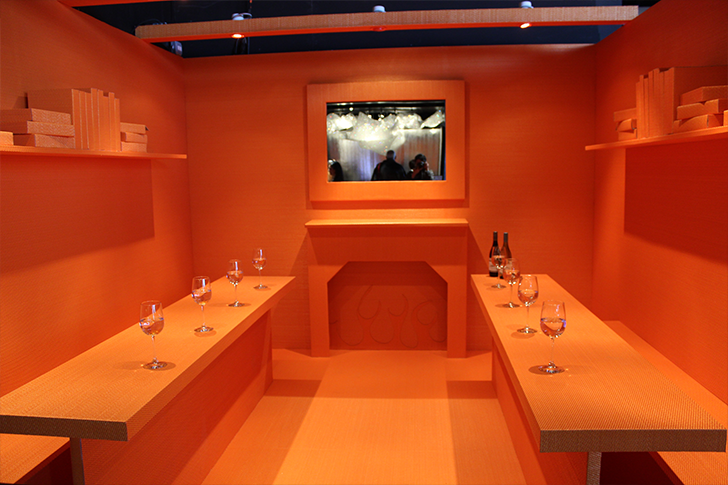 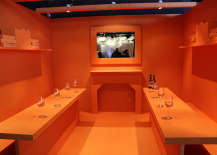 You might mistake Bolon‘s booth to be bland at first, but take a closer look and you’ll see it’s a tantalizing study in tangerine.